AJB Window cleaning has been established for 15 years in the Maidenhead area. We offer a reliable, professional and courteous domestic and commercial service in the Maidenhead and Thames Valley area. We offer a range of services that include regular domestic window cleaning, conservatory cleaning, solar panel cleaning, gutter clearance and UPVC fascia, soffit and gutter cleaning. We also offer a commercial window cleaning services please see our Commercial Cleaning Section or our Domestic Window Cleaning Section for details. We have full Public Liability insurance and all our work is guaranteed. We can supply written references from our domestic and commercial clients if needed. 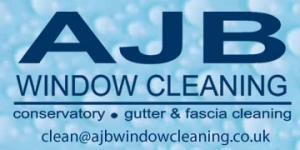 We offer residential Window Cleaning, Gutter Clearing, Fascia Cleaning, Conservatory and Solar Panel Cleaning services throughout Maidenhead and in The Fisheries, Riverside, Bray, Pinkneys Green, Sandisplatt, Burchetts Green, Hurley, Knowl Hill, Littlewick Green, White Waltham, Waltham St Lawrence, Shurlock Row, Hurst, Twyford, Sonning, Henley, Cookham, Cookham Dean and Winter Hill postal areas.